I have a burning question about the word yuan fen. I recently heard it has made its way into the English vocabulary like feng shui, dim sum and wok etc, is it true? If not, how do we explain this particular Chinese phenomenon to the westerners? Thank you. How can we explain the meaning of yuan fen to westeners? Have you got an answer ready? If not, you should read on and have a listen to this programme. For a lot of native speakers of English such phrases as feng shui, dim sum and wok have become their everyday vocabulary. But 'yuan fen', on the other hand, is not something that they seem to understand. 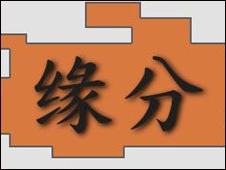 缘分 is perhaps one of those words that need some explanation in to correctly understand its meaning. Join BBC bilingual expert Shirong for a full explanation of this very special Chinese phrase, which is making its way into the English language. 大家可以点击节目录音，收听示范录音和讲解。For full explanations just click on the audio box. Enjoy.